The vygie plant, or Mesembryanthemums, are truly South Africa’s most colourful group. Their silky-textured flowers are available in just about every colour of the rainbow and will give an extraordinary luminosity to any border. The Afrikaans name ‘vygie’ is based on the fact that the top fruit capsule resembles a small fig. With more than 1 800 species to choose from, whatever your taste in plants and garden design, there will be a vygie variety for you. Ice plant (Drosanthemum): A low-growing, ground-covering species that is differentiated by the dew-like, shiny cells on their leaves – hence their common name ice plant. Delosperma: An ideal plant to grow in a succulent rockery or as a ground cover in a shady spot. This species of vygie is identified by conspicuous seed compartments. Lampranthus: A mat-forming vygie plant that has smooth leaves and large, shiny flowers. Livingstone daisy or Bokbaaivygie (Dorotheanthus bellidiformis): Plant this low ground cover in autumn for a burst of colour come springtime. Its green or maroon-hued leaves are shaped like tongues. Yellow-bloomed vetkousie (Carpanthea pomeridiana ‘Golda’): Also a spring-flowering plant to be planted in autumn. A sunny rockery on north- or west-facing slopes are ideal sites. The hedgehog vygie (Delosperma pruinosum) will tolerate partial shade and flower well. Water Plant vygies in well-draining soil. Water immediately after planting. After this, allow top soil to dry out completely before watering again. Once established, vygies are drought-resistant and will only need to be watered during extended dry periods. Vygies thrive in many different soil types and need little nourishment. Replace the very densely-flowered, highly colourful vygies such as Lampranthus, and ice plants (Drosanthemum) with cuttings every second or third year. This is because they are relatively short-lived. 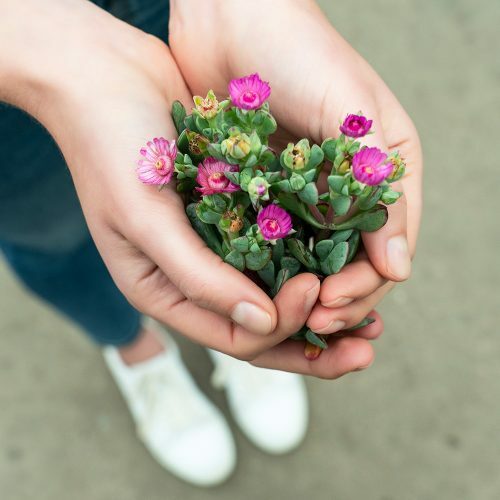 In general, the species that do not flower as profusely – such as Delosperma – live much longer, and are a better investment for a low-maintenance garden.